Every service performed to main dealer standards and beyond. This may seem like a bold statement, but there are many "johnny come lately" Porsche specialists on the south coast, but to our knowledge we are the only independent Porsche specialist, who only work on Porsche cars, have all the main dealer levels of equipment, main dealer technical information and experience spanning decades. Modern Classic Porsche that only covers a few miles per year? Even if your Porsche only covers a few miles per year, it still needs servicing annually, or in some cases, such as some 1980's models, twice a year. Once your engine has run with fresh engine oil a chemical reaction in the oil will begin that no amount of modern oil additives can prevent. Decerning buyers of modern classic Porsche models know this and therefore not only could you be physically damaging your Porsche by not servicing it as frequently as the service book advises, but also you could be damaging the resale value too! Everything in between the new Porsche and the classic Porsche? If your Porsche is neither a classic or a new Porsche, you are in good company with JMG Porsche, the majority of our customers own these models and we work had to keep our prices keen and our quality levels higher than available elsewhere. It is why our standard prices include Porsche approved oil by Quantum/Fuchs as well as providing an option for using Mobil-1 Engine oil for those that want the best. It keeps our baseline prices low but with still great prices, as well as not limiting the quality of servicing. For all Porsche models we recommend annual servicing, not only for those higher annual mileage cars, or those with modern classics which are hardly driven, but for every model in between. A good example of this we feel are the differences between the Porsche 996 and 997 which highlights this important issue. The 996 and 997 have almost identical engines, with many shared parts. However with the 997 the factory schedule often suggests two yearly servicing, whereas the 996 suggests annual servicing. The 997 Models suffer with "Bore Scoring", Variocam actuator issues, cam follower issues and many other problems that the older annually services cars do not... Food for thought. 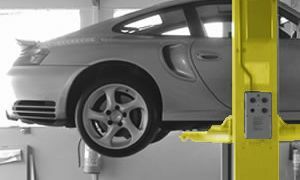 If you feel you and your Porsche need a slightly customised service, that is not a problem. We have many customers with a modified Porsche or very low annual milage Porsche with unique servicing requirements, talk to us about these, as we will be able to help. Porsche servicing can seem complicated, with intermediate maintenance, minor servicing, major servicing and different things needed at different mileages. If you are unsure, we are here to help, just book in for a major service and explain to your service advisor that you are unsure which service you require and ask them to check. We will then look at the service history and advise what is best suited to your car, based on current mileage, age and previous service stamps in the book. By booking a major service, we will have all the parts needed for the major service, as well as have scheduled enough time, but if all you need is a minor service, we will be happy to downgrade things for you at the obviously lower price and less time spent, we always have plenty of other things to get on with in the remaining time. Click on the servicing menu above and select your Porsche from the drop down menu to see our dedicated page about your Porsche model with our latest prices. Call us on 01202 488800 to book your service today.